Okay, they are really great anytime, but especially after a sleep-over. If it is a big boy sleep over, I double the recipe. Eleven-year-olds can put away a lot of pancakes! If you just need a few for just one gluten and dairy free cutie, cut the recipe in half. These also freeze nicely for “toaster pancakes.” If you are going to freeze them, cool the pancakes completely, separate the pancakes with wax paper, and put into a freezer bag. Remove as much air as possible without crushing the pancakes and seal. Flax seed “goop”, pumpkin, mashed banana, apple sauce and mashed sweet potato can all individually replace the egg. They will help with binding and moisture if you can’t use eggs. They will, obviously, change the flavor of the pancakes, but they are all yummy and make a nice change of pace. You can add spices to compliment the binder you chose, such as cinnamon with the apple sauce or pumpkin pie spice with the pumpkin. Fresh blueberries or whole banana slices are nice in banana pancakes. 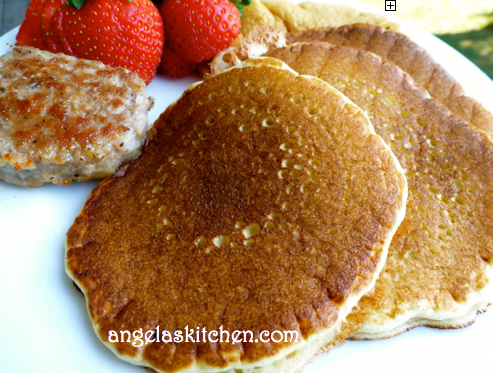 Use 1/4 cup of pureed pumpkin, banana, apple sauce or sweet potato per egg you are replacing in the pancakes. For flax seed “goop”: Mix 1 Tablespoon ground flax seed with 3 Tablespoons water. Let this sit for a couple of minutes, stir again, then add to recipe. This replaces one egg. Whisk the dry ingredients together in a bowl. Mix the wet ingredients together until blended then add to the dry ingredients. Stir until blended together. There will still be some lumps, but try not to have too many. Cook 2-3 Tablespoons of batter per pancake in a preheated lightly oiled pan as you would regular pancakes, flipping pancake over when there are bubbles on the surface and the bottom is golden brown. Serve with your favorite topping and enjoy! I like the goop idea for replacing an egg. I will have to remember that. Flax only works for binding, not the levening part. So, be sure to use a bit more of what you are using to rise your baked good if you need your egg to rise AND bind what you are baking. Hi Angela! I am so happy to have found your blog (via Orgjunkie’s Menu Plan) My 4 yr old eats GFCF along with no chicken, eggs, corn or soy. My whole family is now trying to eat at least GFCF, and it’s going pretty well, but we are eating very simply. I’d love to make delicious pizza but haven’t figured out what to do for cheese; so I am going to look through your archives for recipes. 🙂 What a blessing! My 4 yr old has eaten GFCF since he was 2, and it’s much more fun (and easier) now that we’re all trying it. I haven’t actually posted my pizza and “cheese” yet, but I can this weekend, if you would like.